An extra £3 million is being put into anti-bullying schemes in England where older pupils are trained to step in to resolve conflicts and help victims. The government wants to build on pilot schemes in schools to expand what is known as "peer mentoring". The charity ChildLine has been involved with the pilot schemes, which ministers say have cut aggression in schools. Children and Schools Secretary Ed Balls said bullying was something everyone had to stand up to. "Bullying is totally unacceptable in whatever form it takes. It is not an issue we can sweep under the carpet," he said. "Peer mentoring - young people supporting each other to stamp out bullying - is an exciting scheme that is already having great success in many schools. "I want more schools to benefit by testing different forms of peer mentoring at different age groups." He said research showed children being bullied most often wanted to confide in a friend rather than go straight to a teacher. The scheme would not be a substitute for disciplining bullies but would help deal with the problem. The government says it wants these pilots to test out various forms of peer mentoring. These include pairing a new child with an older one who mentors them; "buddy" schemes for playgrounds; training children to listen to other's problems and "cybermentoring" where young people support others who are being bullied on the internet or by mobile phone. 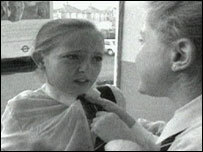 According to the NSPCC charity, starting secondary school can leave children especially vulnerable to being bullied. One in three children calling ChildLine about bullying is aged 11 or 12 - the age that most children leave primary school for secondary school. The latest figures from the helpline showed that a quarter of more than 37,000 children who rang in the year to March 2007 said the bullying happened outside the school gates. Chris Cloke of the NSPCC said: "It's very worrying that so many children calling ChildLine about bullying are at the age of starting secondary school. "It's vital that all children feel able to speak out about bullying and know who to turn to for help." What is needed is a comprehensive, unilateral, nationwide policy of zero tolerance. We must be given the tools to discipline the bullies, and stop the singling out of the victims. Meanwhile, teachers are calling on the government to protect them from cyberbullies. The NASUWT union called for mobile phones to be treated as potentially offensive weapons and banned from lessons because teachers have been filmed in lessons and the images put on the internet. The union said it wanted to outlaw school policies which required teachers to provide their mobile phone or email contact details to pupils. Chris Keates, NASUWT general secretary, said: "Whilst the government's focus has understandably been on pupils, the workforce must not be forgotten. Teachers need protection too".